The 1979 Ghia luxury group is available for both the 2-door coupe and 3-door hatchback body styles. This luxury package which consisted of several exterior and interior options including: color matched dual remote control mirrors, quarter louvers, and body side molding inserts; and luxury soft interior seats. White 1979 Mustang Ghia optioned coupe with a tan vinyl roof, upgraded original wheel covers, and the base 85hp (at 3600rpm), 200 cubic inch (3.3 liter), 6-cylinder engine. White 1979 Mustang Ghia notchback owned by Will from Rossville, Georgia. It was light blue in color. It has the original 5.0L 302ci V8 engine and an automatic transmission. This car has no mods except wheels and paint. It is a 3rd owner. It runs great ant the interior is in great shape. It has no rust or dents - never wrecked. The glass and interior is in great shape. Light Medium Blue 1979 Mustang Ghia hatchback with turbine wheel covers, color keyed mirrors, color keyed rear quarter window louver panels, 5.0 fender emblem, and a 5.0L 2-bbl V8 engine originally rated at 139hp (at 3600rpm). Repainted Medium Vaquero Glow 1979 Mustang Ghia hatchback with aftermarket wheels/rear spoiler and a 5.0L V8 engine. Unfortunately the body side molding, front grille and headlight molding have been painted over. They were probably all originally black, still a very nice car, and wait till you see the interior. 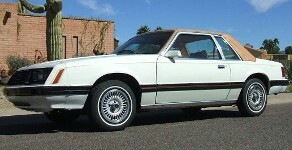 This is a Ford promotional photo of a Medium Grey 1979 luxury optioned Ghia Mustang with wire wheel covers, pin stripes, full wraparound wide black bodyside moldings with dual color-coordinated accent stripe inserts, dual color-coordinated accent stripe inserts on bumpers, usually turbine wheel covers, color-keyed window frames/louvers, dual remote control styled mirrors, bright belt and rocker panel moldings, and rear mounted Ghia insignia. On the inside are low back bucket seats with headrests, color keyed deluxe seat belts, Ghia door trim badge, door soft inserts, door map pockets with carpeted lower panels, sports steering wheel, light group, roof-mounted passenger-assist grab handle, right-hand visor vanity mirror, Ghia sound package, and carpeted luggage compartment.